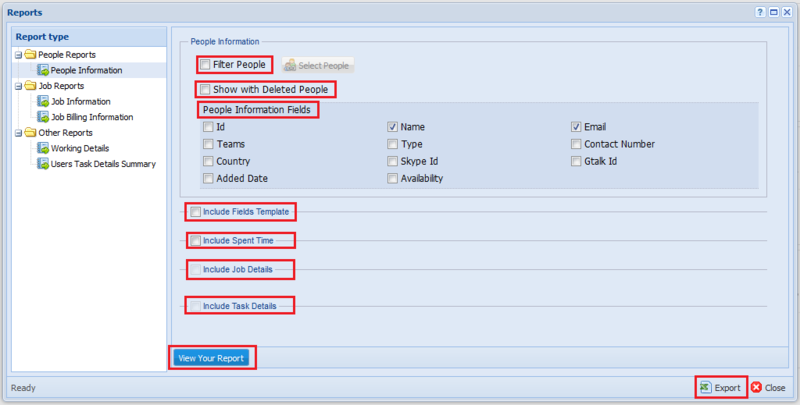 “Reports” function allows users to generate pre-defined useful report types such as, People Reports, Job Reports & Other Reports. This option is available only for “Admin” user(s). Source of “People Reports” are users. Based on users, you can generate different reports with various fields according to your reporting requirements. Step 1: Main view -> Click on drop down -> Click button. Note: If you do not select this option, the report will be generated including the information of all users in the system. Step 1: Go to section -> Click on “People Information” tab -> Click on button. Step 4: Click button to apply changes. Step 1: Go to section -> Click on “People Information” tab. Step 2: Click on option to activate this feature in reports. To include user related information in the generated report. Note: You should at least select one “People Information Field” item to generate the report. 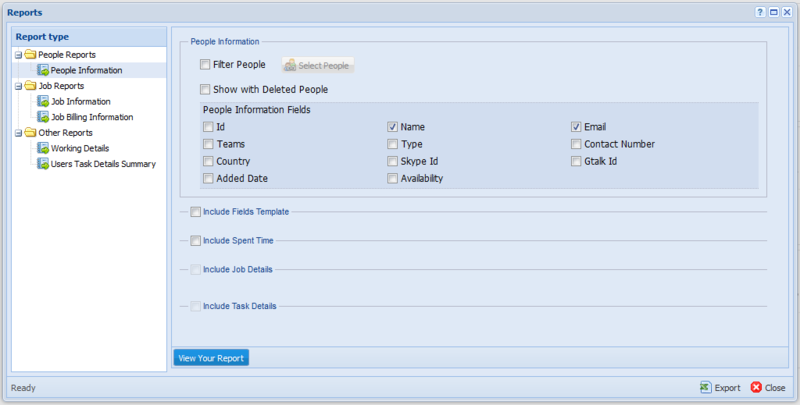 This option allows users to use “Field Template” information on the report and, to filter fields under each template. Step 1: Go to section -> Click on “Job Information” tab under section. To calculate user spent time in terms of dates, months, and years. Note: This will enable “Include Job Details” feature and “Include Task Details” feature. To include job related details into to the report. Step 2: Click on button to proceed. Note: If you do not choose this option, the report will be generated from the details of all “Jobs” in the system. Note: You should at least select one “Job Information Field” item to generate the report. Note: If you do not choose this option, report will be generated from the details of all “Tasks” in the system. Note: You should at least select one “Task Information Field” item to generate the report. Step 2: Select necessary fields and information you require. Step 3: Click on button, to view the preview of the report. Step 3: Click on button in the left bottom of the window. Step 4: Click on button in pop-up window to confirm the action. Source of “Job Reports” are jobs. Based on jobs you can generate different reports with various fields. Step 1: Main view -> Click on drop-down -> Click option. Step 2: Click on tab under section. Note: If you do not choose this option, report will be generated from the information of all jobs in the system. Step 1: Go to section -> Click on “Job Information” tab -> Click on “Filter by State” drop down button. 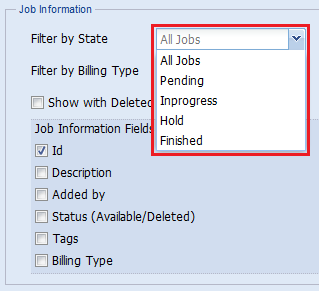 Step 2: Select a “Job State” from the “Filter by State” drop-down list. Step 1: Go to section -> Click on “Job Information” tab -> Click on “Filter by Billing Type” drop down button. 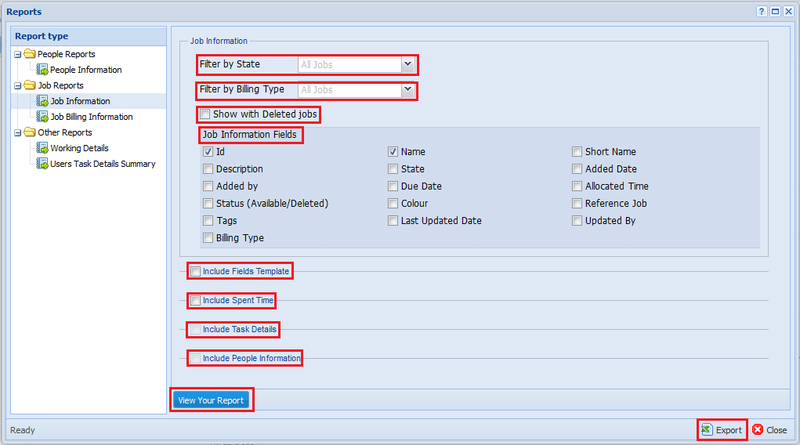 Step 2: Select a “Billing Type” from the “Filter by Billing Type” drop-down list. 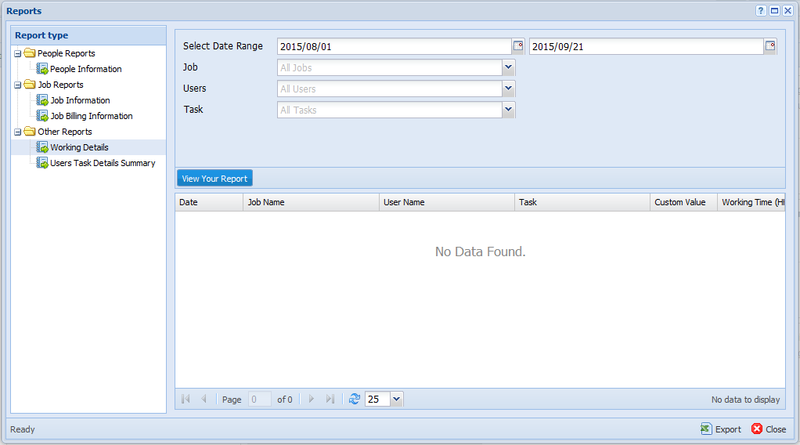 Users can find the data related to deleted jobs of the Organization using this option. Step 2: Click on to activate this feature in reports. Step 2: Click on desired fields under . To calculate user spent time, in terms of dates, months, and years. Note: This will enable “Include Task Details” feature and “Include People Information” feature. Step 3: Select , or options, based on your reporting requirement. Step 3: Click on button to select a specific Task from the system. Note: If you do not choose this option, report will be generated from the information of all users in the system. Step 1: Go to section -> Click on “Job Information” tab -> Click on button. 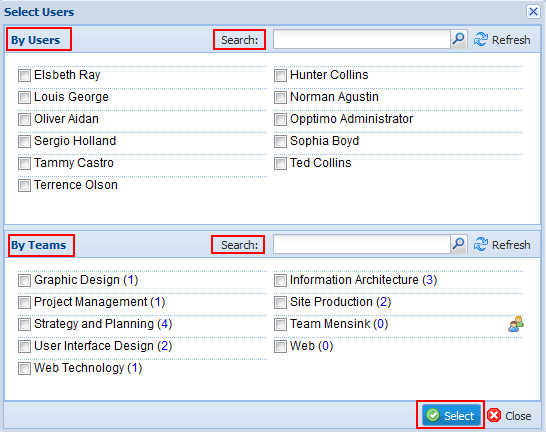 Step 3: In “Select Users” window, select users by “Name” or by “Teams”. Job Billing Information reports are unique reports to provide with the Billing Information of jobs. Job Billing Information reports are generated through job details. Source of “Job Billing Information Reports” are jobs. Based on jobs you can generate different reports with various fields. Step 1: Go to section -> Click on “Job Billing Information” tab -> Click on “Filter by State” drop down button. 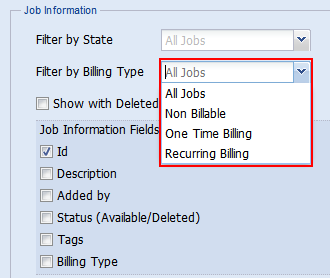 Step 1: Go to section -> Click on “Job Billing Information” tab -> Click on “Filter by Billing Type” drop down button. Step 1: Go to section -> Click on “Job Billing Information” tab under section. 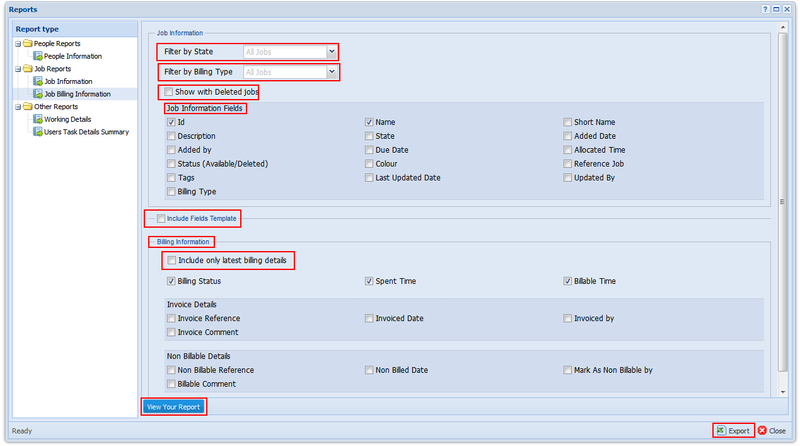 This option allows users to generate “Job Billing Information” reports according to different requirements. Step 2: Click on preferred fields related to “Invoice Details” & “Non Billable Details”. This feature allows users to filter the latest invoice details for each job. “Other Reports” section consists of pre-defined and easy to use reports for generic purposes. To generate a detail report of work Date, Job Name, User Name, Job Task, and Working Time of users in the system on a specific date range. Step 1: Go to section -> Click on “Working Details” tab under section. Step 2: Select a <Date Range> for the desired Report. Step 3: Select a specific “Job” or keep the drop-down with the default option, to continue with “All Jobs”. Step 4: Select a specific “User” or keep the drop-down with the default option, to continue with “All Users”. Step 5: Select a specific “Task” or keep the drop-down with the default option, to continue with “All Tasks”. Step 6: Click on to preview your report. Step 7: Click on button and to save the report on your computer/ storage disk. To generate a summary report of User Name, Task, and Total Work Time spent for a Task on a specific date range. Step 1: Go to section -> Click on “Users Task Details Summary” tab under section. Step 2: Select a |<Date Range> for the desired Report. Step 7:Click on button and confirm to save the report on your computer/ storage disk.